The First Part: Game of a visceral way. …I amused myself from the first moment, the graphical design is very attractive and simple, this I finalize for the potential user the one that is directed, in this platform. Even with this, this one quite very worked ,with own details of another videogames more hardcore2*, but good to what I go. You have an introduction like head-board of series of TV, more than an introduction of the argument. 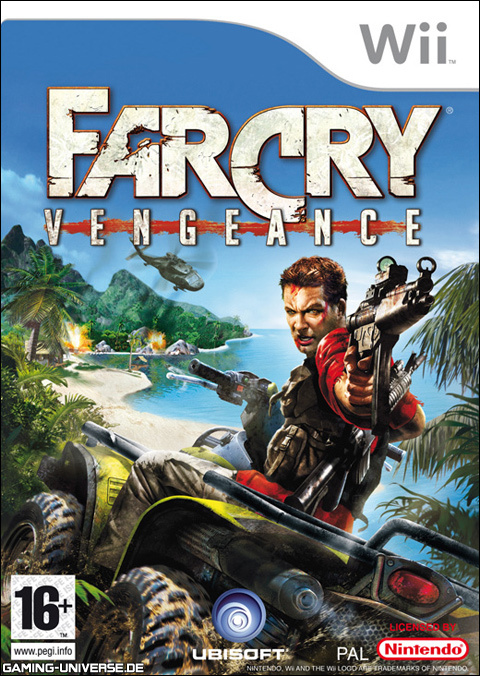 Later one asks yourself to create a user’s profile and later there goes out the screen of the title of game where already there is made clear what the Wii and Far Cry offer together: Precision and shots; Since it is possible to shoot on the screen and this one is the way of selecting the options, shooting literally on them. In the menu we will find everything necessary: One-player Mode, Two-Players Mode in split-screen and the configuration. At all time by means of a global access we will be able to change the used profile, this way to accommodate the controls, or technical adjustments to every user. Inside the One-player mode, we can begin a new game and/or continue the one that we have begun, because in the Far Cry it is not possible to save the game when it is wanted, this one is saving automatically as we overcome chapters or scenes, called in the slang Checkpoints4*. There are people that this way of saving does not like anything and to my particularly does not worry me, I understand that the game needs pace and this way the creators make sure themselves of it. This form of narrating, approaches more the literary narrative or of T.V’s serial, for having differentiated parts, managing it by means of the elimination of saving the game “when you want, where you want”, this one is the way of avoiding that follow the history where for us it is more suitable to follow the game. Remaining alone an opportunity to create a history and to perform “consistent” with the made thing. With everything “we have infinite lives ” so we continue being a bit like gods. It is the classic structure of the video games, friends. In addition we can load a concrete map, of the already overcome ones like improving the item in this level or recalling a level without having to happen for the whole game. And finally we have a somethig like of Jack Carver’s diary, which it is necessary to say that it is succinct, succiiiiinct… hehehe; But less it gives a stone, and it is necessary to say that, since detail not this one badly, in addition we can see, in this type of things, that we are before an important franchise and a game that, at least in this type of details, it was trying to be a product of high quality. We shoot at new game, that it was … if I do not remember badly at the end of December of 2007. When caught it from me almost out of catalogue for approximately 27 little Euros. I wanted very much this game, I had seen a dozen of movies or something like that. Since there was no a lot of visual information or in movement, only well-known and fulminating critiques. With everything, the game calling me the attention, like a lover of the shotters and the experience that they give, with the memory of not having played in my PC in the past, which already could not with the game and because not to say, when I buy the Wii in Christmas of 2006; “The Far Cry on the Wii is like as that of the Xbox 1. Already I will buy it, that the games of shots (Aka: Shooter’s) in the Wii, they are better ” And yes, they are played better, for my, the precision and the experience of to aim, in a literal way, is absolutely real. I had verified it already with Red Steel, which I have liked also enough. But the first thought-desire, the graphic apparience, Since this cannot be friends. First, because it is not possible, There is what exists, and the worse of this case, and since we will see hereinafter in detail. there are no facilities on the part of the machine and are not time to look for viable alternatives. Conclusion: This is the Far Cry of the Wii, for the good thing and the bad thing. shooter1*: A Game of sticking shots with sight in the first person, as if you were your same. hardcore2*: It refers to player of more classic games inside a system. Normally: Player of PC + Game of Shots + Last generation PC+ many hours of game. Intro3*: Video or movie of beginning of a video game, though also generalized to any video inside a game. Checkpoints4*: A necessary goal to finish, inside a video game.